It seems as if us Aussies just want the biggest and best when it comes to tow vehicles. 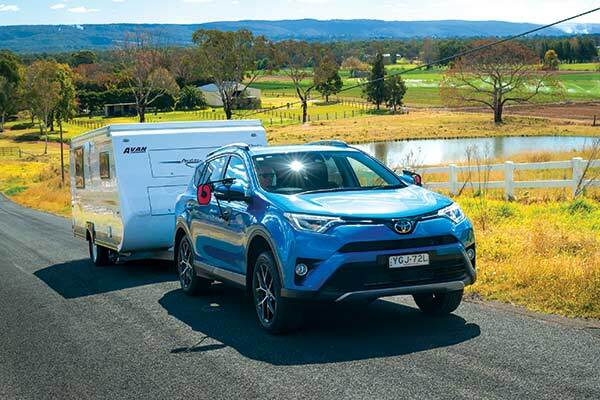 That’s no surprise when you consider the increasing popularity of bigger caravans with showers and toilets – you need something with a decent towing capacity to lug them along. 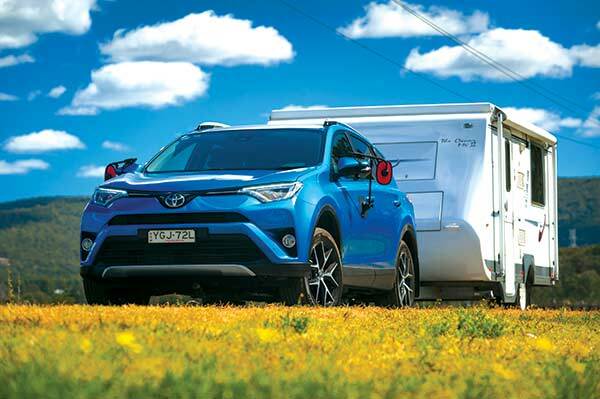 Yet there is also a growing interest in smaller, lighter vans – and their accompanying nimble tow vehicles, such as the Toyota RAV4. While the RAV4 comes in 2WD and 4WD variants and with two petrol engines (2.0L for the 2WD, 2.5L for the AWD) and a 2.0L turbo-diesel (in AWD only). Here we have the GXL 2.5L auto AWD. The current RAV4 is based on the 2012 model, but with significant revisions in late 2015. As part of that update, the RAV4 got a larger lower grille, LED projector headlights and LED daytime running lights. New wheel-arch mouldings and rocker panels, LED taillights, a new wheel design, a shark fin antenna, a new instrument cluster, a more rigid body and trailer sway control cap off the changes. The RAV4 was given another freshen up last year, adding digital radio, Sat Nav, and Toyota Link to the GXL model tested here. Standard gear on the GXL includes 18in alloy wheels, privacy glass, reversing camera, dual-zone climate-control, sports front seats, keyless entry/start, rain-sensing windscreen wipers, auto on/off headlamps, digital radio and a 4.2in infotainment screen. For $2500 extra, GXL buyers can opt for the Advanced Safety pack, which includes forward collision warning, lane departure warning, blind-spot monitor and rear cross-traffic alert. 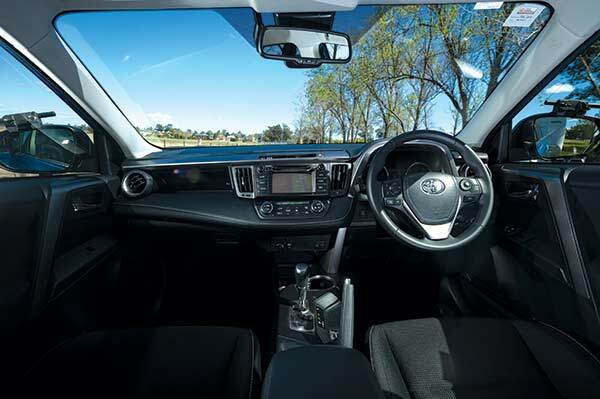 The interior of the RAV4 GXL looks plain but is functional and well put together. The seats are supportive and there’s plenty of room for four adults and their gear. Some centre console switches are a bit hard for the driver to see, and the rear vision isn’t great but then, the rear-view camera covers off what an over the shoulder look won’t. 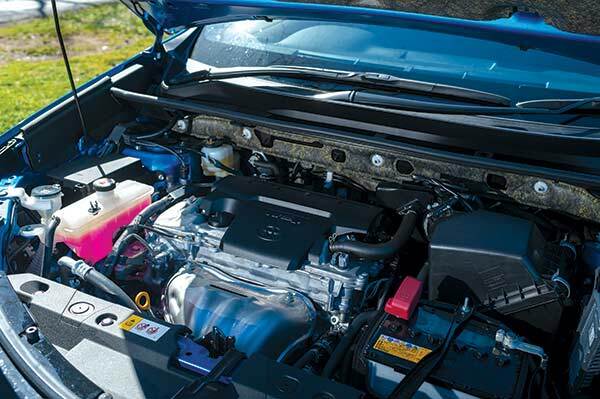 The RAV4 AWD as tested here has the 2.5L four-cylinder petrol engine, although a turbo-diesel is also available. 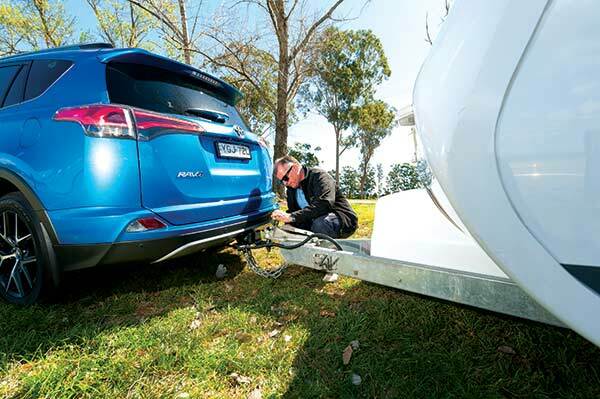 While the turbo-diesel would appear to be the better tow vehicle choice, the problem is that its towing capacity is much lower than the petrol’s – 1200kg versus 1500kg. The 2.5 petrol dual variable-valve (VVT-i) 2AR-FE engine features an acoustically controlled induction system (which improves mid-range torque, according to Toyota), low-tension piston rings, an offset crankshaft, three-stage variable output oil pump and roller rocker arms. The six-speed auto has Eco and Sport modes, while the AWD system – called Dynamic Torque Control AWD – has a Sport mode and cornering control to improve dry-road cornering. It controls the front/rear torque split according to vehicle speed, steering and throttle angle. The Sport mode changes throttle response, automatic transmission shift points, front-rear torque distribution and electric power-steering assistance for better response and feel. 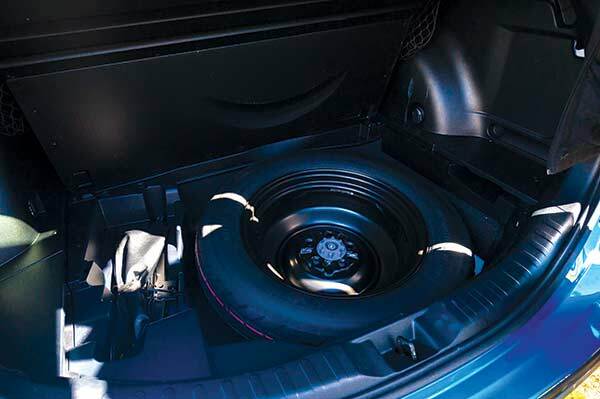 The heart of the Dynamic Torque Control AWD system is an electromagnetic coupling in the rear diff housing. In most situations only the front wheels are driven, and the torque split can be manually locked 50-50 if required. The 2.5L engine revs out quickly to its 6500rpm redline when needed, although it transfers a fair bit of noise to the cabin as revs rise. There’s plenty of torque; this is a good engine overall, hooked up to a transmission with a slick gearshifts and well-chosen ratios. The all-independent suspension blots out large road irregularities very well, although give it enough of a hole to absorb and it will of course thump through it, and small road imperfections are felt more than in its predecessor. The steering is light and precise. 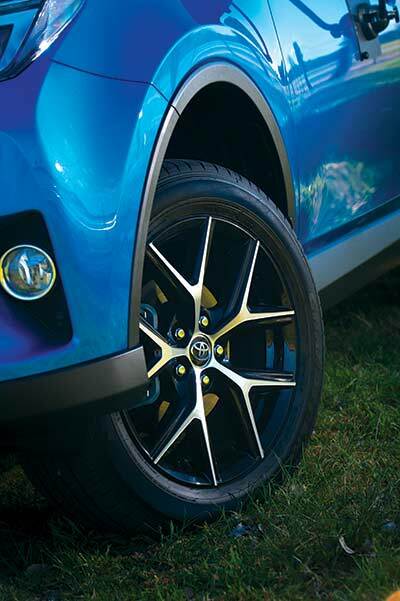 Even though it feels firmer and rolls less, the RAV4 is not a sports car to drive. On test, we achieved 7.6L/100km driving solo and 14.9L/100km with a 1200kg van tucked behind. 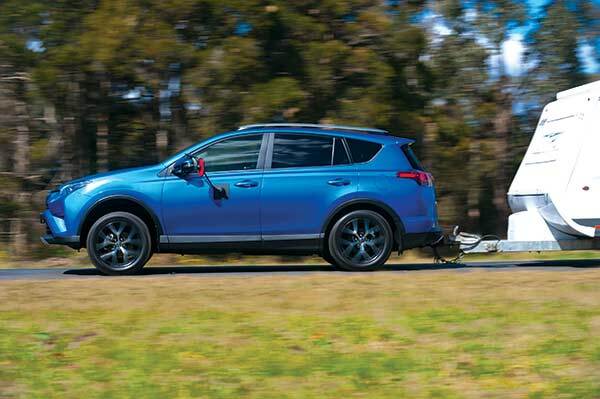 The RAV4 took on towing duties without complaint, although admittedly it didn’t have a huge weight to take on – the van weighed 1200kg Tare and had 135kg on the towball. The front rose 10mm and the rear dropped 55mm with the van coupled up. Despite what appears to be a significant rear droop after hitching up, the Toyota towed our test van very well. Some slight pitching was the extent of it; no swaying and ride quality was very good. The engine felt the weight of the van of course, but was strong on our hillclimb, washing off only a little speed at full throttle up the hill. 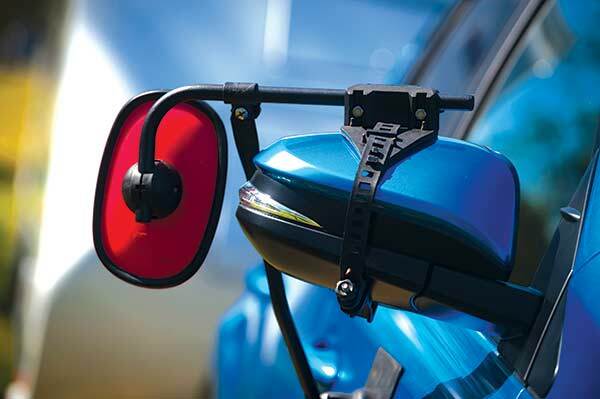 Engine braking was not so good, while the side mirrors are shaped adequately if you were to use clip-on towing mirrors. Within its admittedly fairly low capacity the RAV4 is a great tow vehicle. 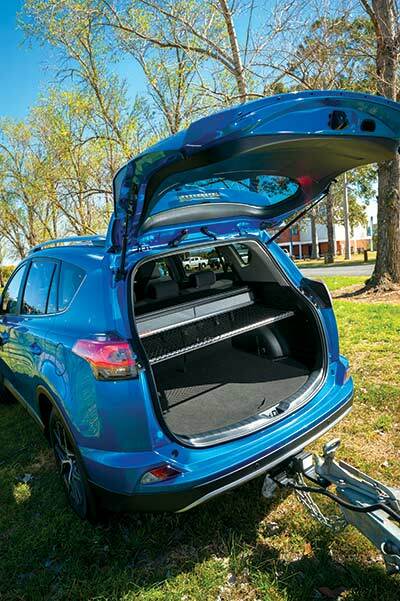 Although it could perhaps be a touch more economical when towing, the RAV4 is stable and powerful when lugging a van. Thanks to Parravans Caravan World, 38-40 Mileham St Windsor, NSW 2756, (02) 4577 5577 for the loan of the caravan for this test. The full tow test appears in Caravan World #569. Subscribe today for the latest caravan reviews and news every month!